This story takes place in a psychiatric clinic in Tokyo. They have a special treatment room underground called the "Tropical Room" where they treat patients with a remedy invented at this clinic called "the Tropical Remedy". This remedy puts patients in a virtual reality experience in the energetic tropical environment. The patients you see here are materially fulfilled but far from mentally satisfied. Doctors hoped to bring back to the patients "vitality to live" and yes! the treatment began to show its effect, butccc Through the incidents between doctors and patients, and the stories their family has to tell, this story will probe into the illness of the modern Japanese people. 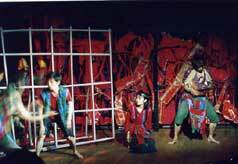 This piece was nominated at the 15th Parthenon Tama Theater Festival.